Is this Purifier Right for Me? If you need a massive reduction of harmful contaminants like mold, bacteria and odors in approximately 650 square feet, then this is the right purifier for you! If you suffer from frequent colds and flus or have lingering odors you just can't get rid of, then this is the right purifier for you! Please keep in mind, that without any filters to replace, this air purifier will work better to kill organic substances than to remove actual particles. What Does the Airfree Do? 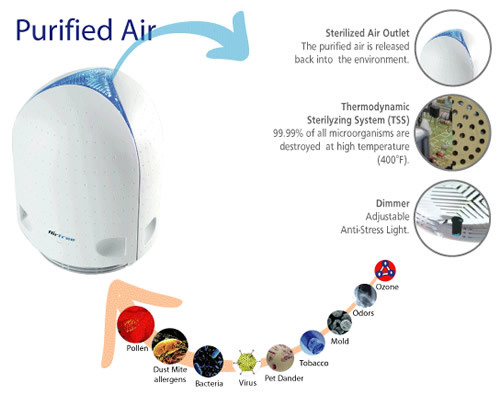 Airfree Air Sterilizing TSS™ technology uses heated air to destroy airborne contaminants and allergens. This is a great system for people living with asthma, allergies or other respiratory conditions, or for anyone who simply wants cleaner, more breatheable air in there home or office. What will it Remove From the Air? The Airfree purifier uses heated air to destroy airborne mold, bacteria, viruses, dust mites and pollens. It pulls air into the internal chamber which then heats the air to 392°F to silently destroy mold, airborne bacteria, viruses, pet dander and common household dust mites in a room up to 650 square feet without changing the room temperature. This air purifier draws less power than a 60 watt light bulb and unlike commonly available ionic units, it does not produce harmfully elevated ozone levels. Not only is Airfree's patented breakthrough technology more effective, but also much simpler to use than anything else available in the air cleaner market. Airfree's patented ceramic core uses a totally natural process to incinerate 99.99% of all unwanted contaminants from your indoor air without the use of any filters, lamps or any other replacement parts. Airfree is completely Maintenance Free! Just Plug it in and forget it! No!! In fact, it actually reduces existing indoor ozone which the American Lung Association indicates can be a serious irritant and asthma trigger when found in high amounts. You can use the Airfree Purifier anywhere it can go! 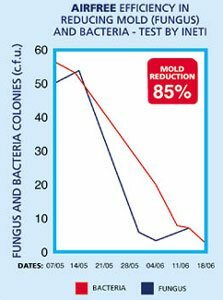 Drastically reduces airborne viruses, bacteria, molds, mold spores, dust mites and more! Has the Airfree Been Tested for Effectiveness? YES!! It's actually the Most Tested Air Purifier on the Market! Not only is the Airfree the most tested air purifier, but the most successfully tested. Here is why: Airfree's exclusive patented Thermodynamic Sterilizing System (TSS™) technology has been independently tested in "real life" working environments by world renowned institutions and ISO 17025 laboratories in six different countries including the USA, Sweden and Germany. These tests prove that Airfree totally destroys up to 99.99% of microorganisms that pass through its patented TSS™ no matter how small or hazardous they might be. There are many more tests are available to view. Click here to view more. Is the Airfree Technology Safe? Yes. Airfree TSS™ technology generates no ozone, no dangerous emission, no ions, and does not use UV light. In fact, independent tests in laboratories in Sweden demonstrate that Airfree actually reduces ozone by 26%. With no need to change dirty contaminanted filters or clean dirty blades there is no contact with contaminated materials. A huge benefit for people with allergies, asthma, or other respiratory conditions who can suffer from the exposure to these dirty filters and blades during replacement procedures. Airfree's exclusive TSS™ technology completely destroys and eliminates all organic contaminants, all microorganisms as well as its harmful elements including their bio-toxins. Most microorganisms, such as mold spores, remain a great threat even after they have been killed as their bio-toxins remain active. It is important to choose an air purifier that destroys ALL of these harmful elements and Airfree Air Purifiers are the one! Why Choose Airfree Air Purifiers over the rest? Replacement filters can cost $150 or more per year and UV bulbs can cost you dozens. Why waste all that money of replacement parts when safer Airfree Technology can be used instead? Some air purifier or air cleaners must operate at extremely fast speeds to reach there highest potential and with all that air movement comes lots of noise. Airfree is completely silent! Airfree offers exceptional performance while being harmless to the environment. It uses very little electricity to run and also does not contribute to the landfills by requiring all those replacement filters and/or lamps. Also, Airfree does not emit any ozone or additional VOC's. Just plug the Airfree Air Purifier into the nearest outlet, place on a table top or floor and begin enjoying the benefits of cleaner air almost immediately. Airfree's extraordinary new technology was designed for 24/7 usage without a jump in electricity consumption. 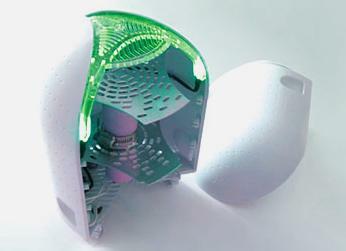 In fact it costs about the same to destroy harmful contaminants in your home as it does to power one light bulb. Microorganisms reduction begins just 15 minutes after Airfree is plugged in. Airfree destroys dust mites, molds, fundus and other microorganisms that are the main offenders in triggering allergies, asthma and other respiratory conditions. No need to touch or change dirty and contaminated filters. Electrically safe assured by the CE and TUV Seals of Approval. Airfree Air Purifiers TSS™ technology is ozone and ion free and has no hazardous emission. Airfree® reduces ozone, which according to the American Lung Association and EPA may trigger asthma-like symptoms in those with severe asthma. Airfree® has a rugged and durable design with no moving parts, resulting in virtually no wear and tear. Airfree TSS™ Technology uses heat alone to incinerate airborne microorganisms. No fiberglass filters, triclosan-coated paper nor any type of material harmful to you or your family when disposed of. Airfree is the only technology that reduces ozone while simultaneously destroying microorganisms. The exclusive Airfree dimmer controlled anti-stress light is ideal for children's rooms and can also be used as a night light or turned off completely. Inside Airfree's patented ceramic core, 99.99% of all microorganisms (spores, fungus, bacteria, viruses, mold, dust mite feces and skeleton) are burned at temperatures around 400°F. This is all done without significant heat contribution to the ambient air. Two Airfree's in the same room contribute as much heat as one adult person. And the greatest part is that no microorganism survives this kind of power! Few living organisms can survive Airfree's incredible power which is why it is the ideal air purifier for bedrooms, bathrooms, kitchens and children's rooms. I was sold on this air purifier because of its compact, modern look. The other air purifiers looked like glorified air conditioners, and they looked like they took up a lot of space, so this one proved to be the best fit for my place. But more importantly than how it looks is how it works: ridiculously well. It won't dry up mold in ten minutes, but it certainly makes the air easier to breathe. Dear Airfree, As a longstanding sufferer from dust mites, hay fever and many other things, I think Airfree is fantastic. In the past, I had to close up the house and lie in a dark room for hours to feel better. I now have my Airfree unit plugged in to my bedroom and whenever I am suffering I can go into that room. Within 20 minutes I am 100% better, even with the windows open! I bought this air purifier assuming it would remove allergens and mold and odors but it ended up only removing odors and mold. It is a great purifier because you don't have to buy anymore parts after you originally purchase it but I think because there aren't any filters to replace, it doesn't remove enough particles to really help out with sinus issues and allergies.